If you – like so many thousands – are still plagued by disturbing memories of, for instance, 9/11 when the Twin Towers imploded in New York, this article on how to release body trauma and the video below may help you. Understanding how to release body trauma – and disturbing memories of past traumatic events with EFT-Matrix Reimprinting is the focus of this article. In the video below from the creator of Matrix Reimprinting Karl Dawson this is explained in helpful detail. This method of body trauma release helps parts of you frozen in time due to past trauma to be set free and heal. Because if left stored in your body, the trauma, frozen in time, blocks the flow of life force, impairs your immune system. It keeps you perpetually in fight or flight. It needs body trauma release” or the “freeze discharge” as experts call it for the body to heal. Remember – the body cannot protect and repair itself at the same time. failed repeatedly (in cases like weight loss). Thus trauma from the past can cripple our chances of success and achieving goals now. This stops you living the life you love in areas like love, money, career, creativity and confidence. The secret as we apply it in EFT-Matrix Reimprinting is to source the trauma and then release it from your body. This helps the Younger You to move through the trauma rather than freezing it in your body. Much like you see this polar bear in this video which Karl Dawson introduces in his Matrix Reimprinting training. Watch as the polar bear discharges its trauma – almost as if its having a fit. This is vital to survival for animals in the wild – or in shamanistic ritual. But this is NOT the reality of humans – or caged or domesticated animals. 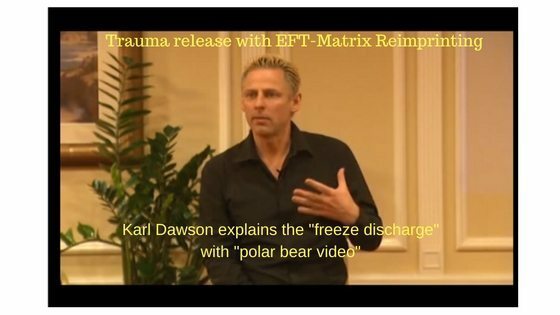 Karl Dawson explains in this video how the “freeze discharge” or trauma release in EFT-Matrix Reimprinting – is key to healing physically and emotionally. In our society we are taught to over-ride our natural impulse to release body trauma soon after it happens. The result is that we often store body trauma, leading to unexplained physical problems, emotional issues, and psychological blockages. Especially true of intense or traumatic things that happen to us in the early years of life. Is it any wonder we suffer pain and post-traumatic-distress down the line? Something occurs many years later – like a small car accident causing whiplash – or a bigger event like 9/11 – and individuals holding buried childhood traumas – will have more than average trouble healing. 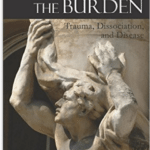 Dr Robert Scaer explains this in his book The Body Bears The Burden – Trauma Dissociation and Disease. 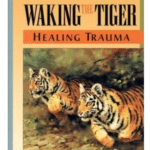 He credits Dr Peter Levine, author of Waking the Tiger and creator of Somatic Experiencing for his original insights into this understanding of trauma in the body. Thankfully we now have Matrix Reimprinting with EFT tapping as a simple, speedy and highly effective way to release body trauma. This gives you a real chance of living the life you love when it comes to fulfilling your dreams and goals for happiness, health and wellbeing.